Remember switchgrass? In his State of the Union address in 2006, President George W. Bush suggested scientists use switchgrass to produce an ecologically friendly fuel. Cellulosic ethanol, he called it, produced from natural materials. Bush's comments made the late-night comedy talk show circuit, but others took his comments very seriously, including a Texas A&M AgriLife Research scientist who had been working on such a project for years. Today, Dr. Jorge da Silva predicts he will release such a product from his laboratory within two years. But da Silva isn't using switchgrass, opting instead for sugarcane, which he said better lends itself to being redesigned and reengineered to help fulfill Bush's dream of "providing 30 percent of our transportation fuel by 2030." "Unlike corn, or even switchgrass, sugarcane is unique in that it can be crossed with different species, including sorghum, to create new plant varieties with favorable traits that are competitive with corn in producing biofuels," he said. Using genetic markers, da Silva transfers favorable genetic traits from a variety of plant sources to sugarcane to make new plant material called wide-hybridization. These new plant varieties would make up the world's second generation of bioenergy plants, with the potential to eventually replace corn and even sugarcane in the production of ethanol, da Silva said. "Those were the first generation plants, corn and sugarcane," he said. "The starch from corn and the sugar from sugarcane were converted to ethanol. But both are food plants that when used to make fuel create a conflict with their ability to produce food. "An increased demand on corn, which is used as animal feed, is reflected throughout the food chain in higher prices. That is a major disadvantage and is one reason why corn is not sustainable as a feedstock for biofuel." Da Silva's plants, the result of conventional breeding and selecting methods, mix the plants' biomass – stalks and leaves—with enzymes to create ethanol. "What we end up with is a sugarcane-based plant with biomass that is at least nine times more efficient in producing ethanol than corn biomass." Texas A&M AgriLife Research sugarcane breeder Dr. Jorge da Silva describes the development of new cane energy plants to produce biofuels. Creating new fuel-producing plant material from sugarcane has challenged da Silva throughout his 12-year career with AgriLife Research. Sugarcane's genetic makeup, developed naturally over thousands of years, can be revamped to better serve growers and consumers, but not overnight, he said. "It took Mother Nature a long time to develop the plant species we see on the planet now," he said. "Even if it takes an entire generation to develop a favorable variety, it's still a relatively short period of time compared to the many years it took to evolve naturally." A major challenge in breeding sugarcane is its complex genetic composition, he said. Some grasses, especially sugarcane, have many more genes and chromosomes than even human beings. While humans have two copies of each gene—one each from the mother and father – sugarcane has ten copies of each gene. "This genetic complexity creates many variables that are not under our control, making it difficult to predict agronomic performance, how it will yield and react in the field," da Silva said. Among the major genetic improvements to sugarcane for biofuels must be its ability to grow outside its comfort zone. Until now, corn has been widely used as a feedstock for biofuel in the U.S. because massive corn acreage is already in place and because corn grows well in temperate zones, he said. Sugarcane, however, is a tropical and subtropical plant, creating a challenge in its competition with corn. "We want it to be able to grow outside the tropics like corn is, to be cold tolerant, drought tolerant, and resistant to diseases and insects. It's called pyramiding, assembling and stacking from different sources favorable genes that control traits." Working in da Silva's favor in meeting the challenges, he said, is Texas A&M University's global reputation, and an efficient plant replication method that rids plants of disease. "Texas A&M is known to be a place of excellence in plant sciences," he said. "People come here to our center in Weslaco from all over the world to witness our science in action and get trained. Texas A&M has a strong relationship with Brazil so we're fortunate in that graduate students are willing to come here to train in the techniques we use in genetics and molecular biology." One of the techniques used in da Silva's lab is a process called micropropagation. Plants to be evaluated can be reproduced much more quickly than through the natural seed-to-plant method and the resulting clonal plant material is free of any disease its ancestors may have carried. "Producing these plants via tissue culture is faster and ensures that we're not spreading plant diseases as these new plants go to the field. And we use bioreactors, some of which were recently purchased from Belgium, to speed up the multiplying process, using less labor and less laboratory space." Using micropropagation is a highly reliable method that allows da Silva to plant bigger research field plots at more sites to gather data on a larger scale. 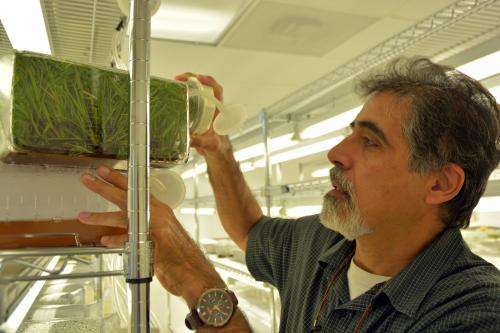 Like water through a funnel, da Silva's crosses and selections have been narrowed down from hundreds of thousands of possibilities to what he calls elite lines, those hybrid plants with the favorable traits needed to more efficiently produce biofuels. The elite are now being tested in various locations throughout Texas. While da Silva expects to produce half a dozen varieties ready for release in about two years, it's a dynamic process that will likely never end. "Plant varieties will always be improved upon because there are always new challenges to plant production," he said. "We're always seeing new diseases, new pests, the industry changes, economics change—it will always be a dynamic, evolving process." As da Silva develops the plant material for efficient conversion to biofuels, facilities to process the varieties are in the pilot stage of development. "That's the other side of this new technology," he said. "When those facilities are ready to produce fuel, we need to be ready with the plant material."